Happy Meatless Monday! Thank you for joining my co-host Deborah and I for hopefully an inspiring link up! It’s the holiday season and with that comes lots of gatherings, get togethers, parties, whatever you want to call them. A few friends over for drinks and appetizers, big family dinners, it seems like there are so many things going on this month. So many that require bringing a dish to share. I have a great one for you today that I think you’re going to love, a Holli-Dates Appetizer! So many reasons to love these delicious bites! They are packed with flavor, made with whole foods, they are gluten free, dairy free, vegan, and best of all they are easy to make! No baking, just chopping up a couple ingredients, stirring them into the cheese, filling the dates, and drizzling a little balsamic vinegar on them just before serving. If you have kids they can even help remove the pits from the dates and fill them. S helped me whip out 48 of these in no time a few weeks ago to take to an early Thanksgiving family gathering. You can easily make a half of a batch for a small gathering like a book club or if you’re just having a few friend over for a glass of wine. So simply delicious and everyone who tried them loved them, even the big traditional “cheese lovers”. I love these because with all the different dietary types, allergies, and restrictions this works for so many (other than those with a nut allergy as I used a nut based cheese). If you don’t have anyone with a dairy allergy, or any vegan or paleo friends and family joining you this is easy to make with traditional ricotta cheese. It’s just so simple, versatile, and delicious. The only thing I didn’t love about this recipe was trying to come up with a fitting name. So when my husband suggested Holli-Dates Appetizer and the girls agreed I was like well ok than. Only at first I called them Holla-Dates. Haha! Ok maybe writing up the post too because it was another one that was just so simple what do you say. So delicious I had to share it. One that I was just hoping I could photograph and get reflect how “simply delicious” they are that the photos speak for themselves. I’m a foodie and I love playing in the kitchen, I’m not a writer. The holiday season is upon us and even for those of us who love to spend time in the kitchen make sure you take time to spend it with friends and family and cherish all the moments! Cut a slit in your dates lengthwise, to remove pit and creating a pocket for stuffing. You can squeeze the ends together towards the center to open them up a little. In a bowl mix together the ricotta cheese, chopped rosemary and dried cranberries. Add a pinch of salt to taste and stir in. Using a spoon and or your hands fill the dates with a little cheese, roughly about a tablespoon per date but no measuring required. Place on a platter. Store stuffed dates covered with plastic wrap in the refrigerator until ready to serve/set out. When serving drizzle a little balsamic vinegar over the top. Enjoy! 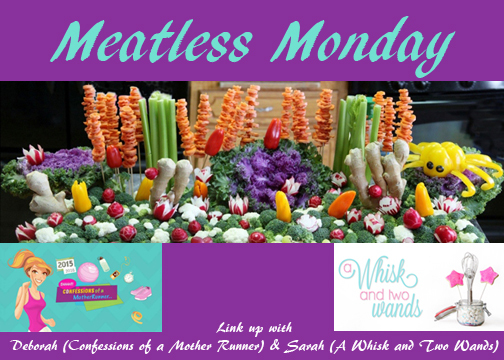 Sharing the Meatless Monday love I’m also linking up with with Running on Happy and The Fit Foodie Mama for Meatless Monday! These sound wonderful– such a lovely mix of savory and sweet! Thank you Courtney and thank you again for joining us! Thank you Deborah! Hope you have a great week as well my friend! This looks amazing Sarah! Love the cheese (or vegan cheese) and date combo! Never would have thought of this! Thank you Julie! It’s such a great combo (with either and for a dairy cheese goat cheese is also a great option). This looks like a fantastic holiday appetizer! I’m always looking for new treats that don’t require heating or bowls! Thanks for the recipe. Haha! Oh I know that love! OMG YUM!!! 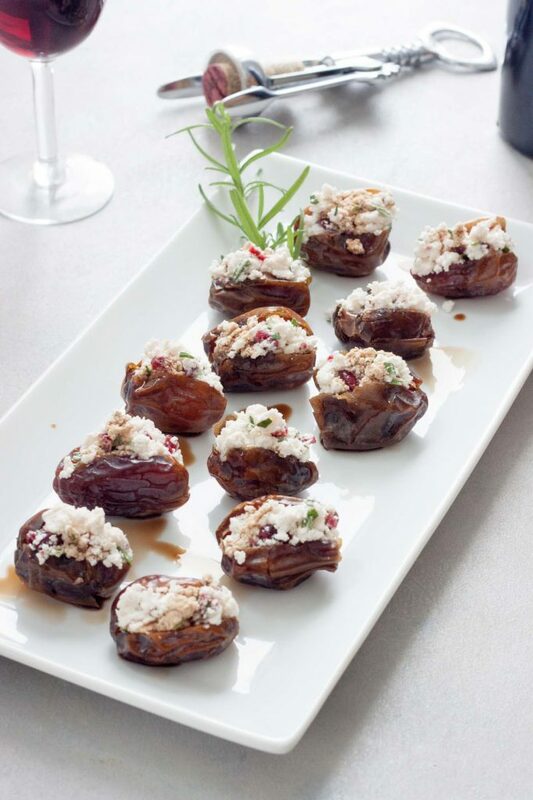 I make stuffed dates with goat cheese but never have with ricotta. SUCH a yummy recipe and perfect for holiday parties! Goat cheese is a great option and what I would have gone with if there were a dairy free one I could find but this is a nice creamy almond milk cheese that pairs well. What a perfect bite, and even better holiday recipe. Everyone loves dates! This looks amazing, perfect for any holiday party! I love the combination of rosemary and cranberries in the filling! Thank you, they really add a lot of seasonal flavor! 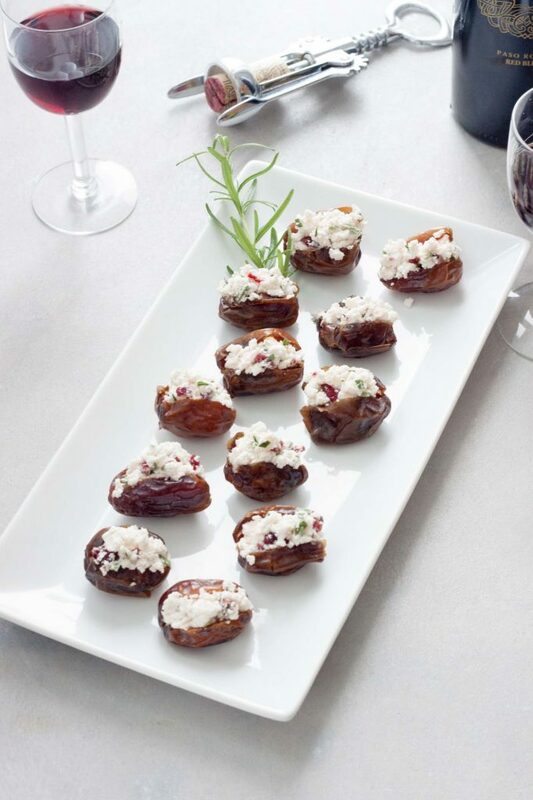 What a perfect appetizer for any holiday party! Love that vegan ricotta! Thank you, I do to it’s very versitle and everyone seems to love it. Those are so cute and festive! What a perfect party idea! These would be a hit with EVERYONE! And your hubby totally nailed the name- very cute! The balsamic drizzle on here looks so delicious! I am doing that this season- 100%! Oh let me know what you think! I love this recipe. I have a holiday party coming up on the 20th. I think I’ll make these! Thank you! If you do I’d love to hear what you think, keep me posted! Wow, it doesn’t get much easier than this! Going to have to give this one a trial soon. It really doesn’t! My oldest who (13) made most of them for our early Thanksgiving get together. Let me know what you think if you do! “Holla-Dates” lol – love this! And love this appetizer! Wish I could reach through this screen and sample a few! Shh don’t tell my hubby, oh wait you mean you love them not the name. Haha! 😉 Come over and I’ll have a plate and some wine waiting for you! ooooo yummy yummy!! I need to try that ricotta! Thank you, yes it’s so good! those sound fantastic and look easy enough to make! always need appetizer ideas! Thank you, they are so easy and delicious! If I made these and they actually looked like your photos 🙂 everyone would ask where I bought them! These look incredible. Haha they are so easy. Thank you! I don’t think I could make these for a holiday party because I would eat them all before the guests arrive! Looks incredible! So simple, but so satisfying!!! NEED to try these. Yes I hope you do! The flavour combo sounds delicious! This is such a pretty appetiser to have this holiday season. It’s a great combo that’s simply delicious! 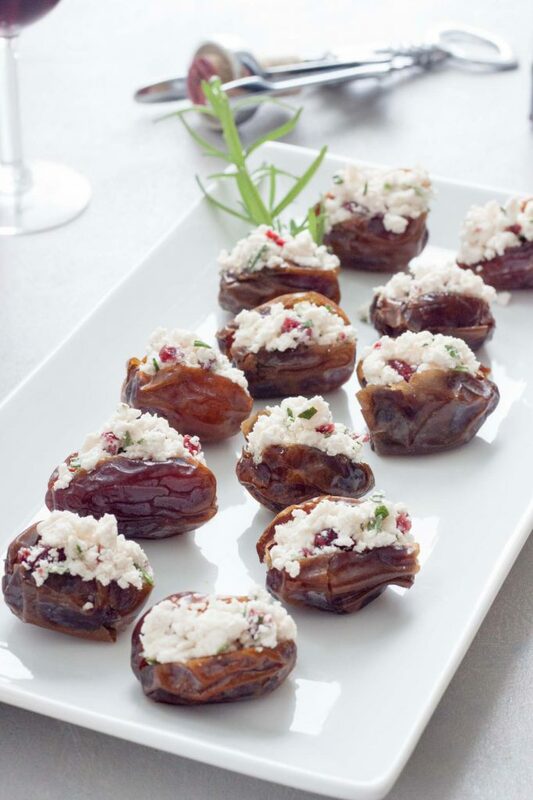 this is such a festive appetizer! i was so curious as to what you used for vegan stuffing…love this. Thank you it’s such an easy appetizer! I was going to attempt homemade almond milk cheese but I decided to just keep it simple. What a great party appetizer! Love that they’re so easy! I love how easy these are to make! 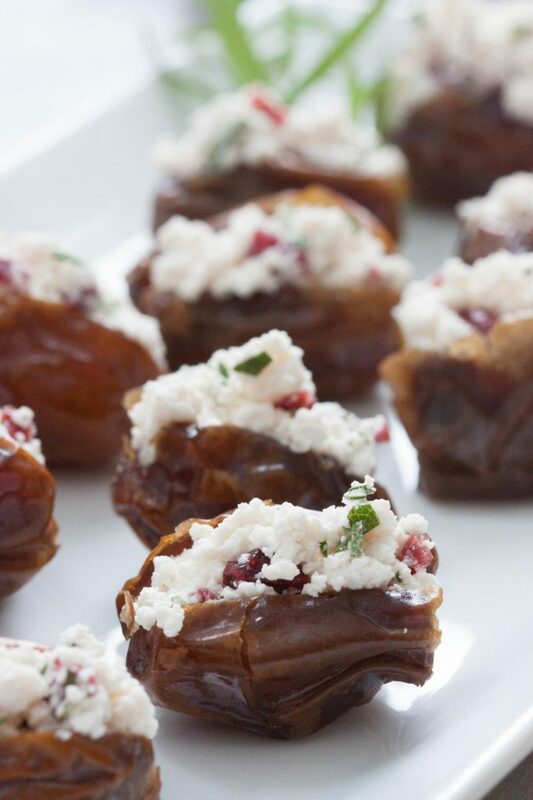 Such a fun and simple appetizer for the holidays. Thank you! Yes they’re simple and delicious! These look lovely! I just bought a big thing of dates at the store the other day, so I will definitely be giving this recipe a try soon! Thank you! Please keep me posted if you do. Ricotta. I was trying to figure out what the stuffing is before i read the recipe. Yes! If you don’t need a dairy free/vegan option goat cheese is a great option! This is such a great idea. Wish I thought of something so easy and delicious as this is! Thank you Taylor! The whole family, even the cheese lovers loved them. Oh we snacked on a few making them, just to give us energy to make more and the other appetizers. 😉 Next time I will probably make a half batch of goat cheese ones as well. I’ve had a lot of stuffed dates in my life, but not this combination! 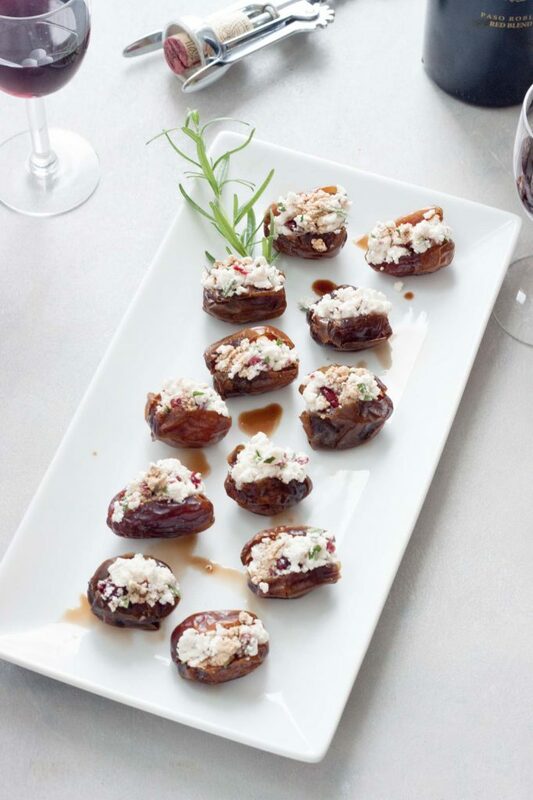 Stuffed dates are just so good! These sound fantastic! Trader Joe’s has an orange baked ricotta cheese right now; bet that would be fantastic in here! I am dairy, soy, gluten free. This would be perfect for me! Thank you so much! I think these will be made in Christmas Eve. I wasn’t aware of this cheese alternative brand. I love Dates! I know it’s 2017 already, but I can still prepare this for Valentines! <3 The combination of sweets, cheese, and the balsamic vinegar, is YUM! Do you have any Gluten Free Recipe suggestion, that's perfect for Valentines Day? I would love to know, please share it with us! Thanks so much!